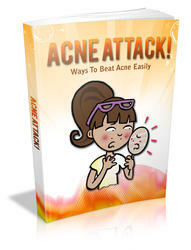 There is no doubt that sebum plays an important etiological role in acne (99,168170). 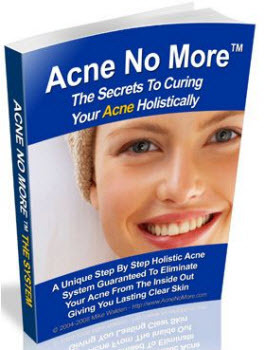 Patients with acne secrete more sebum than unaffected individuals and sebo-suppressive treatments alleviate acne: the greater the inhibition the more profound the clinical response. In addition to elevated sebum excretion, it is well-established that acne is associated histologically and clinically with hypercornification of the duct epithelium (7,38,171). Ductal hypercornification results initially in the formation of microcomedones and eventually comedones, a process termed comedo-genesis. On the basis of a detailed histological study Kligman (7) concluded that comedogenesis began in the infrainfundibulum and was closely followed by hyper-keratosis of the sebaceous duct. This is now generally accepted to a reasonable description of what is likely to happen. FIGURE 5 Environmental scanning electron micrograph of a microcomedone removed from a pilosebaceous duct. Keratinocytes are seen covering multiple hairs. control patients were easy to extrude and contained numerous empty spaces in the cells which appeared to have lost their contents and had no clear cytoskeleton. In contrast, the contents of follicles from acne patients were hard to extrude and the cells were firm and compact (7). 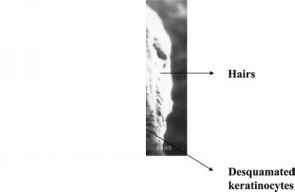 An extensive ultrastructural study on the cornified material in follicular impactions was carried out by Al Baghdadi (174). He showed that corneocytes are arranged into three layers in the follicular impaction: a loosely attached outer layer; a densely packed middle layer; and a further loosely attached layer in the middle of the cast. Lipid droplets occur inside the cornified cells (38,175) and as a result the corneocytes become balloon-like in appearance. Abnormal lamellar inclusions of lipid have been described as a marker for abnormal keratinization (176). Scanning electron microscopy of comedonal contents revealed a complex system of numerous internal channels or "canaliculi" composed of concentric lamellae of corneocytes enclosing bacteria and sebum (177) (Fig. 5). The overall composition of follicular casts was reported to be water (20 -60%), lipids (20%), proteins (15%), and microorganisms (178). Bladon et al. (179) analyzed the protein content of comedones and found both epidermal keratins and degraded keratins to be present in the comedones.